Home » Nursing Homes » What Does A Nursing Home Cost? What Does A Nursing Home Cost? The cost of a nursing home depends on many factors, including location, services provided and whether the facilities you consider offer short-term, long-term or acute care. Insurance or Medicare may pay some nursing home expenses, although how much is covered varies by the plan and care needs. Many nursing home facilities include pricing by the day for those needing short-term care as well as pricing by the month. Genworth’s Cost of Care Survey reveals that in the United States, a private room in a nursing home costs an average of $8,121 a month. For a semi-private room, the average cost is $7,148 a month. Various factors impact how much a nursing home stay costs including location, size, length of stay and services offered. According to the Center for Disease Control’s most recent statistics, 1.4 million seniors lived in nursing homes in 2014 with 15,600 nursing homes in operation. 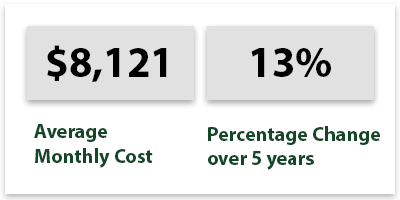 The cost of a nursing home varies significantly depending on the location. For example, in Alaska, the average cost for a private room is $800 per day, whereas the same room in Oklahoma would cost an average of $147 per day. Nursing homes in popular cities tend to cost more than in rural areas. 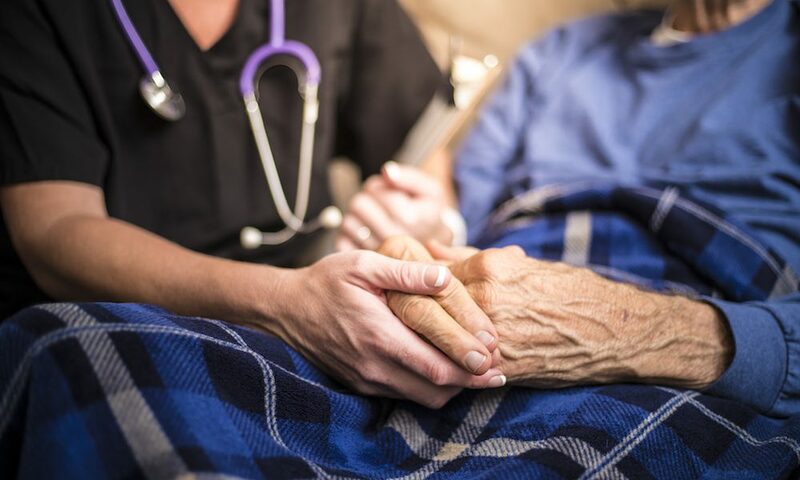 The most expensive states for nursing home care are Alaska, Connecticut, Massachusetts, Hawaii, New York, North Dakota and Delaware with daily costs above $350. The states with the lowest cost for nursing home care are Oklahoma, Texas, Missouri, Arkansas, Louisiana, Kansas, and Utah with daily costs under $185. There is not a single nursing home that is perfect for every person. Each patient has their own needs, health concerns and goals they work toward. Even factors such as insurance coverage and payment options heavily influence your decision. You’ll need to take the time to review the nursing homes in your area to find the best option. Be realistic about your finances. Nursing homes can be expensive. If you’re considering a private room because you want the privacy or a semi-private room that’s less expensive in a better facility, it is better to have your loved one in the best facility possible. Be open-minded about location. There may only be a few nursing homes in your town. By being open-minded and willing to go to a nursing home in the next town or city, you’ll have more options to choose from. Don’t skimp on research. Choosing the right nursing home is important. It’s vital that you research each of your options thoroughly so you can make the best decision. Look at things like pricing by day vs. month, short- and long-term care options and facility licensing. See top picks in person. It is easy to make something look better online than it is in person, or for something great to look bad online. Make it a priority to see your top three picks in person to compare the facility against its online image. Look for disease-specific programs. If your loved one has a chronic or acute health condition, try to find a disease-specific program for the best results. There are cardiac rehab programs, wound care, and diabetes management programs available. Fortunately, there are many nursing homes in the United States to choose from. If one doesn’t look like it will be a good fit, it’s okay to keep looking. The number of nursing homes available increases each year, as the number of aging people in the United States goes up. Even so, some nursing homes have waiting lists, while others only accept certain payment options. Starting your search for the right nursing home early will ensure that you have the best options available. Whether you’re looking at nursing homes for short-term rehab services post-surgery or a long-term option for a loved one that requires 24/7 skilled nursing care, you want to choose the best nursing home on the first try. Each nursing home has its own specialization and the type of care it’s known for. It’s important to make sure that its focus aligns with what your loved one needs. Cost is inevitably one of the biggest factors you think about when searching for senior housing. It’s important to know where you can afford to live based on your personal budget or circumstances. We ranked our cities from least expensive to most expensive to give you a snapshot of nursing home costs by location.